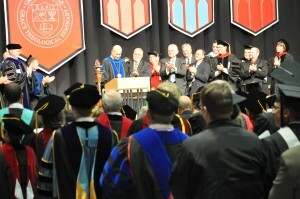 Dr. Bill Katip is honored upon being invested as president of Grace College and Seminary. 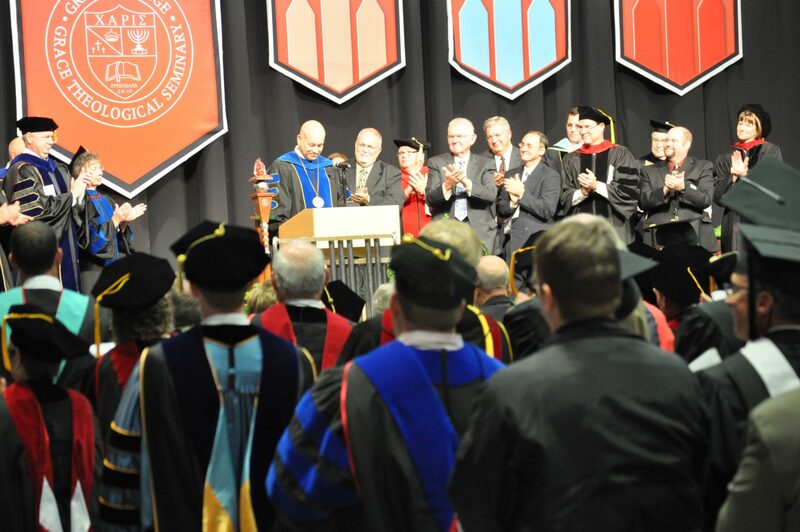 Dr. William J. Katip was invested as the 6th president of Grace College and Seminary in an inauguration ceremony that was full of pomp and circumstance. Faculty, staff, students, alumni, family, and friends gathered to see Katip, a 1974 graduate of the college, honored. Greetings were brought from a variety of constituents. Dr. Paulette G. Sauders, a senior ranking faculty member who is Chair of the department of Languages, Literature, and Communication, represented the faculty and staff. Jacquelyn M. Seal, the 2013-2014 Grace College Student Body President, brought greetings on behalf of the college students, while Roger W. Stuart, the 2013-2014 seminary and graduate school chaplain, represented the seminary and graduate students. Dr. Jeff Gill, vice president and dean of Grace Theological Seminary and School of Ministry Studies gave the institutional welcome, while outgoing president, Dr. Ronald E. Manahan, gave the benediction. Jerry Abbitt, a member of the Alumni Advisory Council, provided kudos on behalf of the graduates of the school. Other greetings came from Warsaw, Ind., Mayor Joseph M. Thallemer; U.S. Rep. Marlin A. Stutzman; Rev. Thomas Avey, on behalf of the Fellowship of Grace Brethren Churches; Dr. Richard L. Ludwick, president and CEO, Independent Colleges of Indiana; and Dr. Richard Nicholson, president emeritus, Robert Morris University. Dr. James Custer, chair of the College and Seminary board of trustees, presided over the investiture, followed with a prayer of dedication by Dr. Verley Sangster, former president of the Center for Urban Theological Studies. William A. Burke, vice chair of the executive committee of the board of trustees, presented the charge to the president.